Not a fan of suicide, but also wouldn’t want to be hooked up to an intelligent and devious A.I. weapon that is just looking for excuses to kill. Mauricio is hanging in their despite his tattered mental condition. He has to be deliberate in order to not be tricked by the crafty Jabby. He might get solace, yet. Well, spoiler, but he is sitting at the table with Nogg and his father while this story is being related, so I assume he’s still not dead. Of course that just means he may have failed several suicide attempts. Mauricio can die happy now. As one does after the constantly pounding hammer stops. This may sound weird, but I’m being honest: Eebs having telekinetic abilities I can accept. That Devyat can be knowledgeable in programming languages and come up with this idea, I can accept. What doesn’t work for me is Devyat using her telekinetic powers to alter computer coding. I know that all data is really just a bunch of 1s and 0s in billions of tiny transistors, but it still feels like cheating. Sorry, Chris. Sharing because I care. I think that she probably altered very little. She either had to get sensors to misread a lower value for what’s needed, or somehow access the programming that allocates power and mess with it. The first is easier and makes it a problem of breaking hardware or really simple coding. Either way I suspect Jabby would eventually inadvertently fix himself because he keeps changing his hardware and he seems to have pretty advanced learning algorithms. Either way Devyat could easily readminister the treatment until a permanent solution is found. Either way I suspect Jabby would eventually inadvertently fix himself because he keeps changing his hardware and he seems to have pretty advanced learning algorithms. 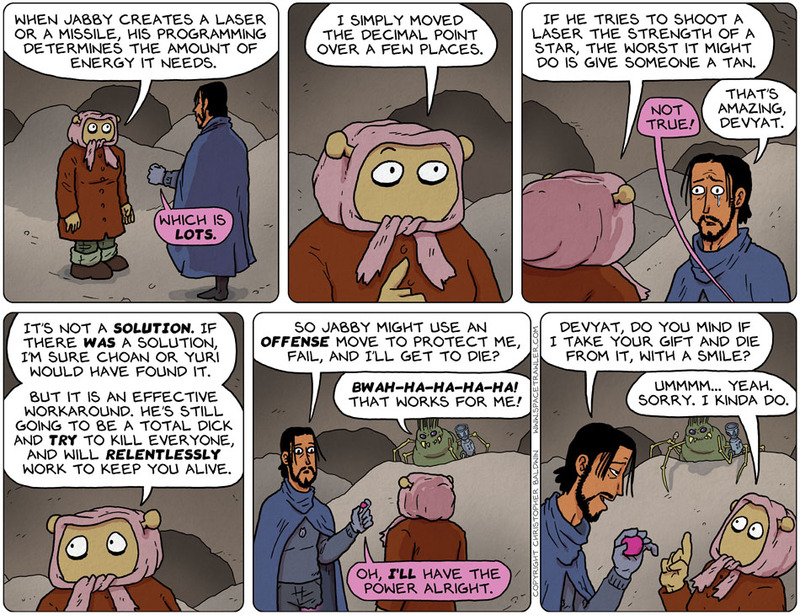 Unless, of course, Devyat also did a little messing with the “tools” Jabby uses. IOW, if you want to mess with an assassin’s aim, don’t jiggle his arm while he takes the shot. Jiggle his scope while setting things up. If you’re banging your head against the wall because you can’t get your power supply to produce a consistent +5V, maybe the problem isn’t with your power supply but with your voltmeter. Making a circle mathematically is more complex than it looks and we’ll never see the full precision of PI. But you can make a tolerable circle with a bit of string and a stick. Our computers today store information in a binary format. I imagine that Jabby is more like DNA. If Devyat’s gift evolved with an intuitive grasp of DNA at a molecular level, she’d be able to make subtle modifications to Jabby by “feel”. @ Herandar: I agree the complexity of Jabby seems prohibitive for hacking it, let alone with such certainty of success. Then again, if Jabby can be looked at more through the lens of biology rather than computer science, this could be more amenable: there are rather basic integrative communication systems that span the nervous and endocrine systems. E.g. messing with the dopaminergic system would have consequences for setting a basic level of movement vigor (among other things), i.e. how much metabolic effort we are prepared to put into actions. I don’t have a problem with her hacking Jabby. I have a problem with her using telekinetic powers to alter computer programming, which isn’t physical. It’s like asking a hacker to move gold bars out of a safe with malware. The virus can disable the alarms and might even be able to open the safe if it is electronic, but it’ll never lift the bullion. Power utilization is but an instrumentality of the far more complex amoral and anosognosic entity that is Jabby. Move a decimal place, and Jabby will move it back. I fear that for all Devyat’s skill at programming, the purpose and the will behind Jabby are not approachable by such crude means. Which means the next thing we’ll see is Jabby’s counter to both Devyat and the Gounder, and the complex consequences of THAT. Or THOSE, depending on how Jabby wants to deploy its resources. Ducking into the foxhole now, here….